Example of a blood splat actor produced by a Pinky bite on the 32X. Id Software has a series of engines they've created over time to run their games, and each one constitutes an evolutionary leap, making first-person shooters more advanced in every possible way. John Carmack is the brains behind this phenomenon. When it comes to game design, however, that is unfortunately where his expertise ends. Every Doom game prior to Doom 3 was made on some variation of what is retroactively referred to as Id Tech 1 (their first breakthrough engine). By the time a Doom game was finally released on a whole new Id Tech, everything else about the game was also reimagined, which made it...well, barely a Doom game at all. It's my preference to believe that Id Tech 1 evolved over the years without the need for a total do-over into Id Tech 2 and beyond (Doom 3 was made in Id Tech 4). Modifications were made by different people over a period of years, and those modifications showed that you can replace parts indefinitely to build something new without scrapping the spirit of what you started with. I know, it sounds like I'm suggesting breeding better horses instead of jumping into a car--maybe even just getting a better pair of shoes. But bear with me. Doom for the 32X and Atari Jaguar were both built off of PC Doom version 1.2. The Jaguar version was written entirely by Carmack himself, and could be considered an improvement over what was built for the PC. CRY color mode, more light levels for everything (textures, weapons, sprites), advanced strobe light effects and blood splat actors. As you may or may not know, sometimes these advances are dependent upon hardware that can implement them, and Carmack took full advantage of the Jag's abilities. 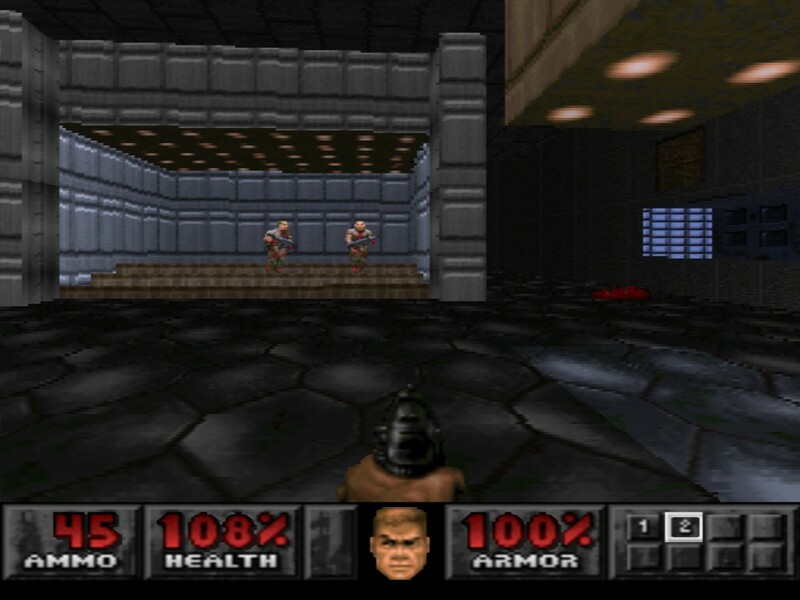 SNES Doom was not made by Id at all, but it did use Doom resources along with its own custom engine. It featured its own set of tweaks to make up for the SNES' weaknesses. You could pause the game to switch weapons. Partial invisibility was rendered as translucency. Strafing was done via the shoulder buttons. SNES Doom was made by Sculptured Software and published by Williams Entertainment on September 1st, 1995. Two months later, on November 16th, 1995, Williams released Doom for the Playstation. Now, as I've mentioned previously, I can't help but think that Williams learned a thing or two from Sculptured Software's SNES version. And since they also utilized a modified version of the engine from JagDoom, they brought in some of the best of both worlds! Alright. So I replaced my ailing Playstation, put in my old copy of Doom, dimmed the lights and fired it up. My goodness--it's like a movie was starting. 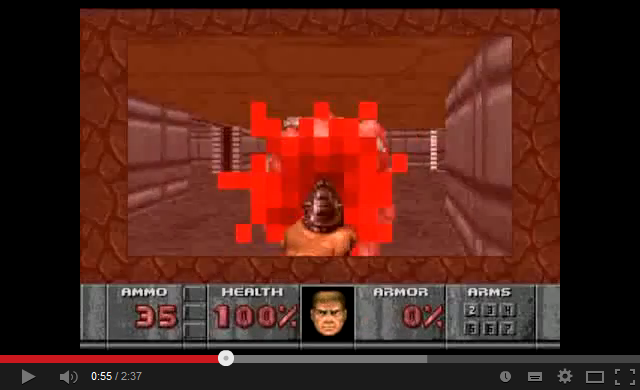 I noticed immediately that it's got to be the smoothest Doom experience since I started all of this. I said before that the 32X's speed was impressive, but it seems as though the Playstation could easily rival it. It looks good, moves well and is intense. The sounds are all new and of a higher quality. The music is ambient and creepy. Both take full advantage of the fact that this is running off a CD. The first 24 levels are the same edited versions from the Jaguar, except they're even more edited, because they feature sectors with colored lighting, Doom II enemies and a new enemy called the Nightmare Spectre. So you could say these levels have gone through two rounds of edits to produce a better all-around product, even if the initial edits were made to preserve space/memory. Even if they were, they were done methodically, not carelessly. That brings us to what was modified between the Jag and the Playstation. Alright. Colored lighting is new and magnificent. It seems to me that there are less brightness levels in general, but honestly, you can't even tell. There are also echo effects in corridors and again, I have to mention the CD-quality sounds and music. The Playstation's lighting works against it at times, but not nearly as often as it works for it. In particularly darkened areas, you can't see a damn thing. I mean, you're trying to navigate and your only beacons are things that are impossible to identify unless they're shooting at you! I complained about the darker areas on the 32X, but at least they compensated by making the sprites bright! It's both a good and a bad thing, because it takes away from the atmosphere and realism, whereas on the Playstation, you've got atmosphere in spades. But I found myself using the automap to navigate, at least until I had to shoot something. The Playstation also makes a noble effort to achieve the Jag's strobe light effect, and almost pulls it off. But it seems to go from end to end instead of from the center out, if that makes any sense. Close, but not right on. Another small fault of the Playstation is the textures. I'm not saying they don't look good, and in fact they're sometimes a tiny bit more detailed than the Jag/32X, but at the expense of making them just a bit more pixelated. And it also seems to suffer the same problem as the other two CD versions of the game from the 90s--instead of the way textures get grainy at a distance on the Jag, or just blurry on the 32X or SNES, any straight lines get jagged. And not necessarily just at a distance. I'm not really sure why this problem plagues CD Dooms in particular, but look up any Youtube video featuring this Doom or the 3DO or Saturn Dooms and you'll see what I'm talking about. Notice the jagged textures at the top? Regardless of these little flaws, however, I've been greatly enjoying my PS1 Doom experience! The architectural edits thrown on top of those already in the 32X/Jag Dooms are mostly trivial. In Central Processing, the stairs that lead to the switch that opens the door across the slime pit are gone. There's just a corridor. A few ceilings in later levels have been lowered, like in the room with the Soul Sphere in Refinery. I can't say it makes much of a difference in Central Processing, but the lower ceilings in some other levels are actually cool in a way. Makes the rooms feel tighter. The object was probably to make them easier to process, but it's nice to see the game evolving. So what carried over from the SNES? Well, it turns out you can pause the game to change weapons on the PS1. It also features translucent invisibility effects, which have been extended to include Spectres, and Nightmare Spectres, which also feature a dark cyan tint. Strafing is done with the shoulder buttons and the PS1 goes as far as to allow circle-strafing! It turns out I'm horrible at it, though--circle-strafing right is easier than circle-strafing left, mainly because the D-pad is on the left side. Tying this back to my original premise, an imaginative person could postulate a divergent progression of the Doom engine in which the 32X was Doom 1.3, the Jag was 1.4 and Playstation was 1.5. The SNES has to be left out since it didn't use the Doom engine at all. But going by this form of progression ignores the fact that if we kept going, by 2.0 we could have had something that rivaled Id Tech 2 at the very least! If the game kept changing hands and seeing further improvements, who knows where it would have stopped? It did see further development when Doom 64 came out, but it's not time to talk about that one yet, so I'll let you do your own research. In short, PS1 Doom is really good; I've already played through 14 levels and can't wait to play more. Create a free website Powered by Start your own free website A surprisingly easy drag & drop site creator. Learn more.